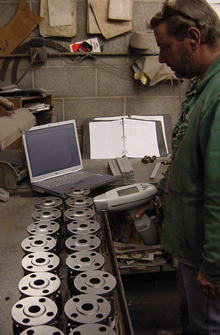 One advantage Nova Precision offers to its customers is the ability to cast a very wide range of alloys. The exact chemical composition of an alloy is a primary controlling factor in the mechanical and physical properties of a casting. To promote consistent, accurate metal identification Nova Precision has acquired a handheld X-ray florescent analyzer. This instrument provides a fast, non-destructive, and highly precise identification of an alloy’s elemental composition within only a few seconds of exposure. Along with the capability to analyze samples brought to our laboratory, we are now able to quickly transport this compact analyzer to the castings, wherever they may be.